There were 650 press releases posted in the last 24 hours and 154,004 in the last 365 days. 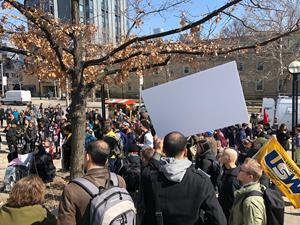 Students gather outside of Sidney Smith Hall after walking out of their classrooms at the University of Toronto. The Ford government announced sweeping changes to the sector, including restructuring the Ontario Student Assistance Plan (O.S.A.P. ), a province-wide tuition cut and funding for campus organizations. The January announcements coming out of Queen’s Park have left many student groups across the Ontario wondering how they will make ends meet in the coming years. Other groups feel the Ford government is out of touch with what University campuses need. “A tuition cut without funding to fill the gap can only lead to increased pressure at the bargaining table, an as much as 5% cut across the board, job layoffs,” said Jess Taylor, Chair of C.U.P.E. 3902. The announced 10 percent tuition cut has come under public scrutiny as it has left many wondering if the government has a plan to support Ontario Universities. “The U of T will have to lower operational costs using other measures like increased student enrolment, increased commodification, increasing international student tuition, or clawbacks in working and learning conditions,” she continued. The government has dubbed the policy the “Student Choice Initiative.” Alideeb continued, “Though the government claims that the Student Choice Initiative is a way to save money, students overwhelmingly reject it because it is an ideological attack on advocacy groups and unions that fight for students' rights. Student groups build community, ensure campus democracy, and provide crucial services."